Creationist research is having a global effect that is worrying the atheists and secularists of this world. They have had it all their own way for over a century but things are slowly changing. For almost twenty five years now, Journal of Creation has been publishing cutting-edge creationist research that has been fueling the war against evolution, creating little fires all around the world, including Great Britain. 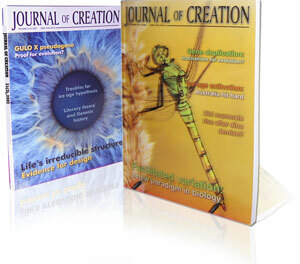 For almost twenty five years now, Journal of Creation has been publishing cutting-edge creationist research that has been fueling the war against evolution, creating little fires all around the world, including Great Britain. Indeed! 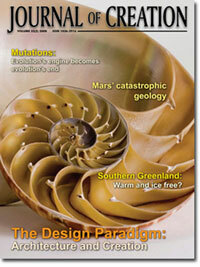 Although Journal of Creation is produced in Australia it is an international science journal. As well as many subscribers in the UK, the Journal is read in the US, Canada, South Africa, New Zealand, Singapore and many other countries globally. What’s worrying for the atheists is that it is a peer-reviewed science journal that does its science within a biblical worldview—just like the pioneers of modern science did centuries ago. Staggering mistake? The difference is that anyone can drive across North America and check the distance for themselves. But how can you travel back in time to independently verify a date—a date that secularists calculate based on unprovable assumptions that a priori discount the Bible as history? Prof. Dawkins does not seem to appreciate the difference between experimental science and historical science. But I’m getting off the track. The point is that creationist research is giving Christian young people the backbone to challenge the atheistic evolutionary philosophy dished up to them in school under the guise of science. According to Dawkins, science teachers don’t enjoy having to defend erroneous evolutionary speculations, especially since these students are often well informed having read scientific creationist publications. Contrary to what Prof. Dawkins suggests, this development is a positive for science and science teaching—it’s something not to be lamented but applauded. Molecular limits to natural selection. Speciation is not the result of an unlimited naturalistic process but of an intelligently designed system. Genetic redundancy. More evidence for the design of life that is very hard for a materialist to explain. Mutations. They seemed like a good idea at the time, but evolution’s engine becomes evolution’s end. Did eyes evolve by Darwinian mechanisms? Although some evolutionists (not mentioning any names) have tried to explain how an eye could evolve by itself, their solutions are clearly … unsatisfactory. The design paradigm. Architecture post-grad motivated about creation science by the evolutionary propaganda she encountered while doing her Masters research. Serial cell differentiation. Another intricate system of design. Romans 5 exegesis. Paul’s teaching about Christ and Resurrection was based on a real historical Adam who sinned and brought physical death. What’s So Great About Christianity by Dinesh D’Souza—strong in most areas but weak in creation. The FOXP2 gene. Supports Neandertals being fully human—so they are not intermediates for evolution. And lots more articles on all sorts of topics about creation/evolution. Over 120 glossy pages of in-depth material organized into research papers, perspectives, overviews, countering creationist critics, book reviews and letter exchanges. You’ll enjoy its solid science, especially since it’s professionally presented, well illustrated and highly readable. So get yourself equipped. No matter your situation in life, whether a student, teacher, scientist, atheist evangelist, theologian, pastor, mother or grandparent, Journal of Creation will inform you, strengthen you and help you trust the Bible in an age of science. Get your subscription today. Don’t miss the latest issue. You can be informed too. Subscribe to Journal of Creation—and catch the current mailing. Don’t forget that a gift subscription could do something significant for some of your friends and relatives, to help them see that biblical thinking can be based on first-rate science. Edinburgh Evening News, Richard Dawkins: ‘Growth in creationist beliefs a problem for schools’, 2 April 2008. Return to text.